The AWT6314R meets the increasing demands for higher levels of integration in dual-band CDMA PCS 1X handsets, while reducing board area requirements by 25 %. 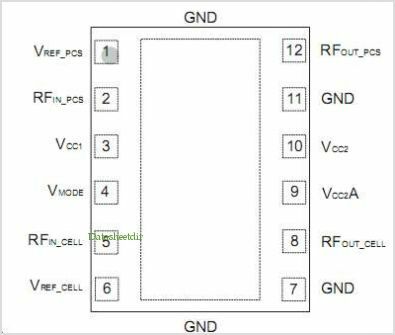 The package pinout was chosen to enable handset manufacturers to easily route VCC to both power Amplifiers and simplify control with a common VMODE pin. The device is By Anadigics, Inc. This is one package pinout of AWT6314R,If you need more pinouts please download AWT6314R's pdf datasheet. 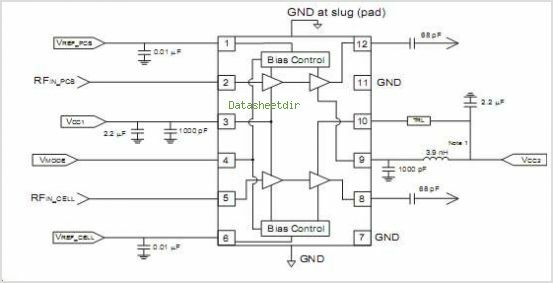 This is one application circuit of AWT6314R,If you need more circuits,please download AWT6314R's pdf datasheet.